The Gamma EC Series of centrifugal supply air roof units can be used for supplying fresh air to an air handling unit or to an air conditioning system. They incorporate the latest state of the art, energy saving EC motor technology and are most efficient where conditions vary during the course of the day. The Gamma EC Supply Series is a simple "plug and play" system which means installers do not need to have specialised control programming knowledge. 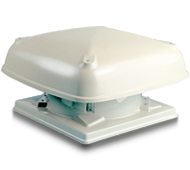 They are fitted with bird mesh which prevents objects entering building or interrupting motor operation and are available in 315, 355, 450, 560 and 630mm fan sizes. Ideal for supplying fresh air to an air handling unit or to an air conditioning system. Also suitable where make-up air or positive pressure is required in the ventilated space. All motor sizes can be pre-configured to suit specific sensors and specific applications, and are supplied standard with 0-10V control input. High performance backward-curved centrifugal impellers fitted.